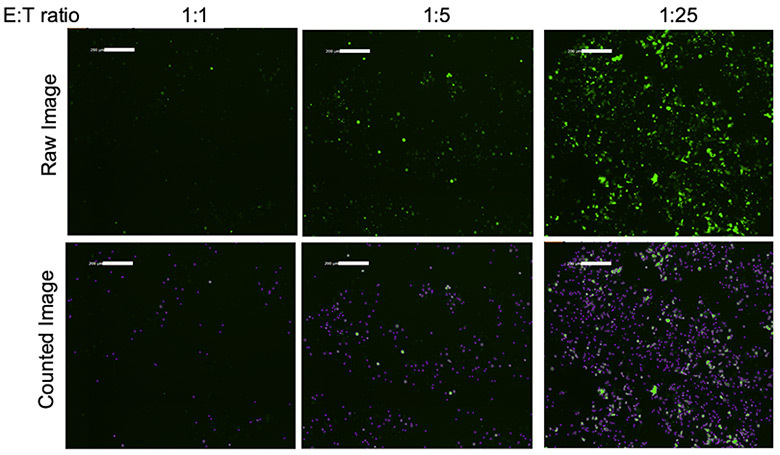 Scan the same plate over multiple time points to directly monitor the killing of target cells. The Chimeric antigen receptor (CAR-T) technology focuses on generating a genetically modified t-cells that can directly bind to, and attack cells of interest. The CAR-T cell is comprised of an antigen-specific binding domain that is fused to the genetically engineered activating motif. Once expressed on the cell surface the CAR-T-cell can then target and attack the specific targeted cells. The entire plate was scanned and analyzed in 10 minutes. 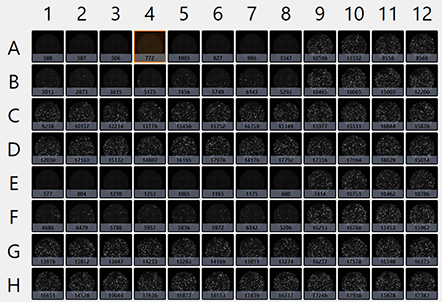 The plate level view shows a thumbnail picture of the full well scan as well as the number of GFP positive cells the software identified and counted.